The 99,300 ton Mein Schiff 3 has officially been christened in Hamburg, Germany for the German based cruise line TUI Cruises. Europe’s newest cruise ship is embarking on its maiden voyage today after a glitzy christening ceremony featuring Mein Schiffs godmother Helene Fischer. 1,700 guest attended the ceremony which included travel professionals, politicians and business representatives. Even several celebrities and popular business executives turned up for the special occasion. 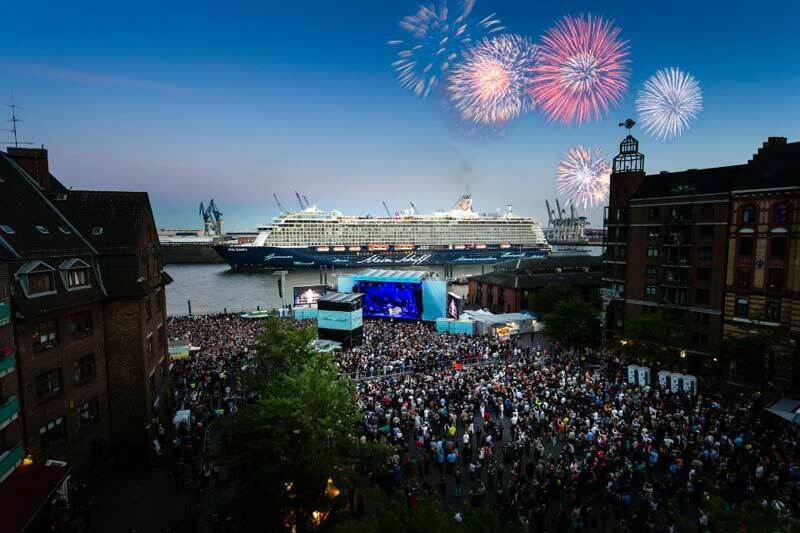 The theme of the festivities was “Diamond Meets Pearl” and to the delight of the guests there was music and performances which entertained at the pier of the Hamburg Cruise Center in Germany. Not long after godmother Helen Fischer was taken up to the ship’s bow on a large pearly balloon to smash the champagne against the hull. This is tradition when naming a new vessel. The ship begins its maiden voyage today June 13th 2014 from the popular port of Hamburg on a nine-day voyage making stops at Le Havre, France, La Coruna, Lisbon, Cadiz and then at Mallorca in Spain. Over the summer season Mein Schiff 3 will be sailing Western Mediterranean and Adriatic cruises from Malta. Mein Schiff 3 has been purpose-built for TUI Cruises which operates for the German market and is owned by Carnival PLC. The ship was built-in Finland by STX Europe and it’s 99,300 tons carrying 2,500 passengers. The vessel cost approximately $625 Million. There is also a second ship of the same class called Mein Schiff 4 expected to be completed in Spring 2015.